Welcome to Mercy Ebute's Blog: Army reveals new boko haram's tactics. Army reveals new boko haram's tactics. The Defence Headquarter has revealed the new tactics devised by Boko Haram terrorists to hide explosives. 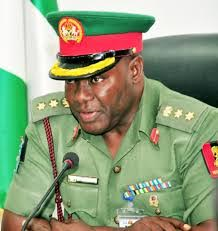 In a statement released on Thursday, January 14, the acting Director Defence Information, Brigadier General Rabe Abubakar said this is a continuation with the sensitization of our citizens on the devilish strategy of the terrorists. "The Nigerian Military authorities have discovered that the Boko Haram terrorists are determined to continue letting off bombs and have resorted to masquerading as fruits and vegetable vendors wheeling Improvised Explosive Devices (IEDs) as groceries into crowded areas,"
''Having been effectively dislodged and decimated the BH terror group has begun some systematic isolated attacks mainly on soft targets in their desperation to remain relevant''. The statement therefore advised Nigerians to be constantly on alert. "Defence Headquarters hereby advises the general public to constantly be alert to this latest terrorist tactics and to report promptly any suspicious persons or objects to the nearest security agency,"
"While commending the general public and the media for their continuous support so far, all citizens are once again reminded that security is everybody’s concern therefore, they should join hands with the security agencies to eliminate the remnant of the terrorists."